At Austin Dental Spa, we are proud to offer solutions to many common cosmetic dental concerns. From tooth-colored fillings and porcelain veneers to gum recontouring and teeth whitening, individuals seeking to improve the appearance of their teeth can benefit from our dentists’ education and many years of professional experience. In addition, patients can opt for a complete smile restoration, combining multiple state-of-the-art treatments into one comprehensive makeover. Dr. Mark Sweeney, Dr. Jordan Slagter, and our team believe that every individual should be afforded a beautiful smile to express their truest emotions. 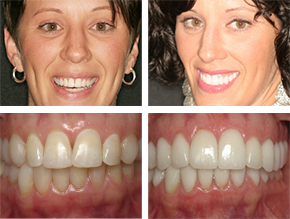 Our smile gallery is a great way to visualize the dental work we accomplish daily. If you feel your smile is not living up to its potential, we encourage you to contact our office. We are happy to answer questions about our cosmetic dental treatments at Austin Dental Spa, and our friendly staff can help you schedule an appointment with one of our skilled dentists. Zoom!® Advanced Power™ is the most effective in-office teeth whitening procedure available. This state-of-the-art cosmetic dental treatment can remove yellowing and stains caused by food and beverages, ultimately revealing teeth 8 to 12 shades whiter. Taking under an hour to complete for most patients, Zoom!® Advanced Power™ can be added onto a regular dental check-up or requested by itself. 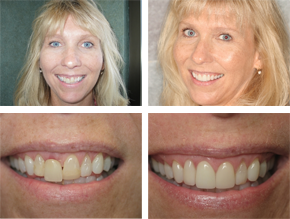 One of our most popular cosmetic dental options is porcelain veneers. Made of a durable ceramic material, these thin shells are designed to conceal chips, stains, gaps, and various other concerns. Perhaps the biggest draws to this procedure are that porcelain veneers can provide a dramatic smile enhancement without excessive surgery, and each veneer can be matched to the color of your other teeth for incredibly natural-looking results. Excess gum tissue can cause the teeth to look shorter, leading to what commonly called a “gummy smile.” With laser gum lifting and recontouring procedures, our dentists can reduce the excess tissue and provide more balance and symmetry between the gums and teeth. Plus, the treatments are virtually painless and there is typically no recovery time necessary. Schedule your smile makeover consultation with Austin Dental Spa today! Dr. Sweeney can use “tooth colored” white fillings to correct a number of issues and protect teeth from further damage. White, composite fillings are much more aesthetically pleasing than traditional metal fillings, and they also offer a number of health-related benefits. White fillings form a stronger bond with the prepared tooth material than metal fillings do, which helps to prevent leakage and thus more effectively protect a damaged tooth. Furthermore, composite fillings are not as heat-sensitive as metal, so they do not expand or contract with temperature change, which can cause discomfort and even tooth breakage. Dr. Sweeney and the cosmetic dentistry team at Austin Dental Spa can not only use white fillings to correct cavities and breaks in newly damaged teeth; we can also replace your old metal fillings for a fresh, healthy smile. Dr. Sweeney and Dr. Slagter are proud to offer same-day porcelain crowns for patients seeking to repair damaged or decayed teeth. Using the state-of-the-art CEREC® 3D system, our dentists can design and create custom dental crowns right here in our office during a single appointment. Once placed over the original tooth, the new crown increases durability, protects against further damage, and helps enhance the smile. For individuals undergoing a dental implant procedure, root canal therapy, or who have a broken or cracked tooth, dental crowns created with CEREC® can be a very helpful, efficient, and long-lasting solution. Dental bonding is a procedure designed to enhance the appearance and function of teeth with chips, gaps, stains, and even misalignments. After applying multiple layers of ceramic resin to the affected tooth’s surface, Dr. Sweeney or Dr. Slagter will focus a high-intensity light over the tooth, causing the resin to harden. Once solidified, the bonding material is carefully sculpted to create an ideal shape and overall appearance. This helps conceal perceived imperfections while also strengthening the tooth. Ultimately, cosmetic bonding is a treatment that can restore tooth structure while offering natural-looking and long-lasting results for many patients. 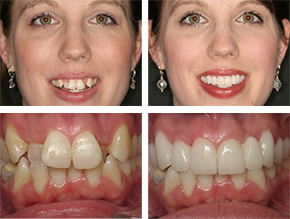 If you have areas of missing teeth, dental bridges can be an effective way to replace them. A dental bridge involves the placement of an artificial tooth or set of teeth between two existing teeth. Porcelain dental crowns are affixed to the surrounding teeth, and the artificial teeth are fused between them. If dental implants are not an option for you, bridges can be a good alternative in that they protect the balance of your bite, the motion of your chewing, and even the structure of your facial features. Missing teeth can ultimately change your facial contours and make your other teeth and gums more prone to disease and decay, not to mention the effect it can have on the function and appearance of your teeth. That’s why it’s very important to have missing teeth replaced, and with dental bridges, many patients experience results that look and feel as natural as their original teeth. The back teeth are often susceptible to damage and decay. Inlays and onlays are commonly performed treatments designed to protect the chewing surfaces of these teeth, enhance their strength, and work to prevent bacteria from invading small nooks and crevices. When combined with good oral hygiene habits, this can go a long way to reducing the potential for cavities and decay in the back teeth. Inlays and onlays can also be very effective treatments for teeth affected by fractures and small cracks. They are placed onto the teeth with careful precision, and since they are made to blend in with your natural tooth color, they are barely noticeable.